There are lots of reasons why City Toyota has become one of the Bay Area’s favorite dealerships to buy, lease, rent, or service Toyotas. Most have to do with the convenience and comfort we offer. City Toyota is located just off the freeway, with plenty of free parking, a directly across the street from the Colma BART station. We also have a spacious, modern showroom and customer lounge. But most importantly, Toyota owners appreciate our friendly approach to doing business. City Toyota is conveniently located just off the I-280 freeway, less than 10 miles from downtown San Francisco. We are directly across from the Colma BART station, with plenty of free parking. We also offer a relaxed, comfortable shopping atmosphere amid our spacious, state-of-the-art Toyota dealership. For the convenience of our Service customers, we offer extended service hours, free shuttle service, Toyota rental cars, and a complimentary coffee and bagel with each visit. With our dedicated Express Maintenance Center, we’re equipped to handle most Toyota service items while-you-wait. That includes the free service visits that come with your Toyota Care program! So if you need an oil change, brake check, or other common service item handled, schedule an Express Maintenance appointment. Take our Courtesy Shuttle to local shopping or dining locations, or wait in our comfortable customer lounge. Certified Toyota Technicians and Genuine Toyota Parts are just the beginning. 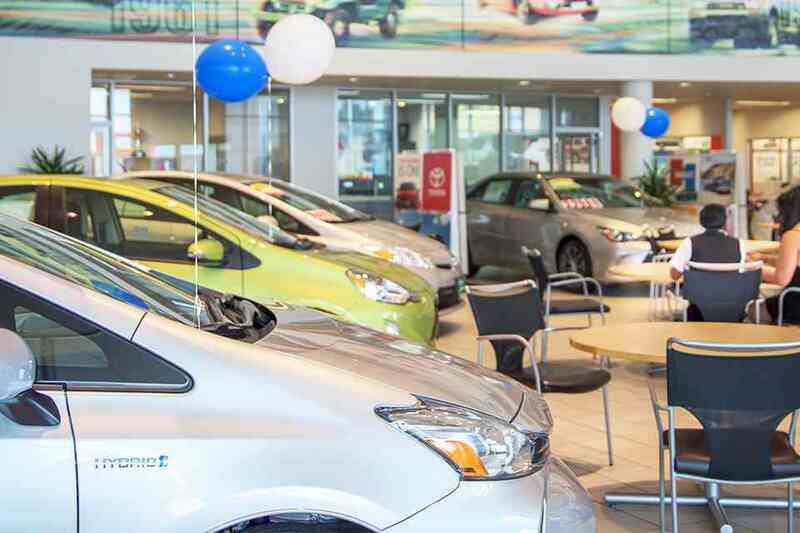 With over 50 service bays in action, City Toyota provides fast, efficient service. And we price that service to be the lowest possible. In fact, we promise to meet or beat any competitor prices. Plus, our Professional Service Advisors recommend only the services your Toyota or Scion needs, helping to keep your bill low. City Toyota gets dozens and dozens of great trade-ins each month. We keep only the best, put them through a thorough service inspection, treat them to a professional wash and detail, and offer them to you at low prices. We even offer used car financing and warranties. See our current inventory online, or visit our comfortable indoor showroom. Not only do we offer a covered Service drive and large indoor vehicle showrooms, City Toyota has a wonderful customer lounge. Whether you’re waiting for your vehicle while it’s in Service, or simply taking a moment to consider the purchase of a new vehicle, you’ll enjoy the free Wi-Fi Internet access, big screen TV, comfortable seating areas, and café. There’s also a separate children’s play area.